Acclaimed actor Alan Rickman, one of fandom’s favorites, died of cancer January 14 at the age of 69. His first few roles in major Hollywood films brought him to the attention of international audiences but certainly did not make him beloved — terrorist Hans Gruber in the Bruce Willis vehicle Die Hard (1988), the Aborigine murdering Elliot Marston (who also tries to have Tom Selleck’s title character killed) in Quigley Down Under (1990), or the Sheriff of Nottingham playing opposite Kevin Costner’s title character in Robin Hood: Prince of Thieves. Allowed to escape the dark side at last, he played the sensitive and caring — and to some irresistible! — love interest Colonel Brandon in Sense and Sensibility (1995). He brought his considerable skills to a quite different character, Alexander Dane, in Hugo-winning Galaxy Quest (1999). And while no one would prefer to see anyone else cast as Severus Snape in the Harry Potter films, I felt they never gave him enough to do until the very last one. Rickman also voiced Marvin the Paranoid Android in the movie version of The Hitchhiker’s Guide To The Galaxy (2005), and the Blue Caterpillar in Alice in Wonderland (2010) and Alice Through The Looking Glass (coming in 2016). 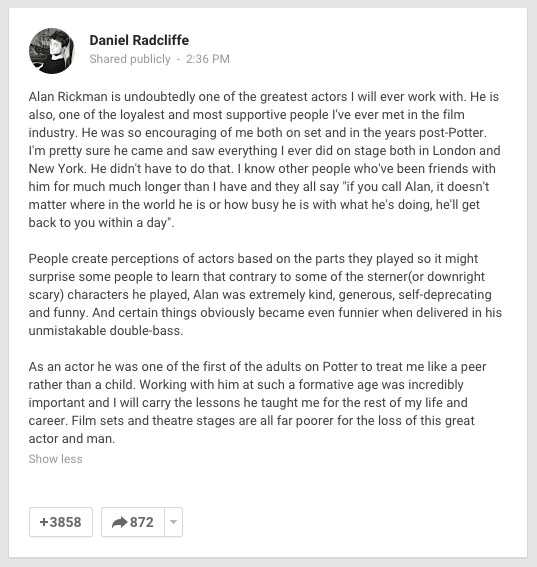 Daniel Radcliffe posted an appreciation on his Google+ page. Beyond a career which the world is indebted to, he was a constant agent for helping others. Whether to institutions like RADA or to individuals and certainly to me, his advice was always spot-on. He put liberal philanthropy at the heart of his life. He and Rima Horton (50 years together) were always top of my dream-list dinner guests. Alan would by turns be hilarious and indignant and gossipy and generous. All this delivered sotto, in that convoluted voice, as distinctive as Edith Evans, John Gielgud, Paul Scofield, Alec Guinness, Alastair Sim or Bowie, company beyond compare. When he played Rasputin, I was the Tzar Nicholas. Filming had started before I arrived in St Petersburg. Precisely as I walked into the hotel-room, the phone rang. Alan, to say welcome, hope the flight was tolerable and would I like to join him and Greta Scacchi and others in the restaurant in 30 minutes? Alan, the concerned leading man. On that film, he discovered that the local Russian crew was getting an even worse lunch than the rest of us. So he successfully protested. On my first day before the camera, he didn’t like the patronising, bullying tone of a note which the director gave me. Alan, seeing I was a little crestfallen, delivered a quiet, concise resumé of my career and loudly demanded that the director up his game. Behind his starry insouciance and careless elegance, behind that mournful face, which was just as beautiful when wracked with mirth, there was a super-active spirit, questing and achieving, a super-hero, unassuming but deadly effective. This entry was posted in In Passing and tagged Alan Rickman, Galaxy Quest by Mike Glyer. Bookmark the permalink. Rickman also starred in what in my memory, is one of the great fantasy films, TRULY, MADLY, DEEPLY. I discovered it one night, changing channels on TV, and there it was, on the local PBS station… Suddenly, there were ghosts playing music.. In my heart, as well. If you haven’t seen this, rush out and get a copy. Just rereading the Wiki synopsis above, brought tears to my eyes, again. Rickman and I, in some instances, had wildly different political ideas, and in some cases, I believe some of his actions may have caused deaths and damage. But his talent as an actor was extraordinary. Thanks for putting this together, Mike. And Rickman played an unforgettable Metatron in “Dogma”, one of his odder roles…. I loved him in Dogma. I loved him in everything, really. Gah. As my husband said this morning, the worst bit is that we’re not losing assholes here, we’re losing incredible people that nobody has an unkind word for. 2016 had better shape up amazingly. Ok, Rule of Three? Are you listening? The third one had better be awful ok? I’m not going to make any suggestions, but awful. Get on it. I feel that we should do something awful regarding beheadings, widows and orphans, and Christmas. He stole that movie. Bruce Willis gave him a yippee kai yi yay on Twitter. He had an outstanding voice. And even in the worst movie I ever saw him in–yes, I saw NOBEL SON–he was worth watching. Dramatic Alan Rickman is dramatic. I’m gonna have to watch Galaxy Quest again this weekend. I’ve only seen it once when it was first out on DVD. The clips everyone keeps posting have reminded me how damn funny it is. And the clips of the Sheriff of Nottingham have even made me want to revisit that atrocity. I kept tearing up all day yesterday (mostly when yet another person would post a photo with the quote about reading Harry Potter when he’s 80) and was worthless at work. I loved him as an actor but never followed his career that closely–it was always a pleasant surprise to see him in a movie. I’m seriously bummed that there won’t be any new surprises. He SHOULD have been able to have that Harry Potter moment at age 80, dammit. The quote actually does not seem to be from Alan Rickman. Not that this makes his passing any less sad; he was a fine actor in many memorable roles, and he will be sorely missed. By watching this, you have donated to Save the Children and Refugee Council. YouTube gives advertising revenue to whoever uploads a video. The more views on the video, the more money we receive. We will pass all that money on to charities (LINKS BELOW). Share this video to make an impact. 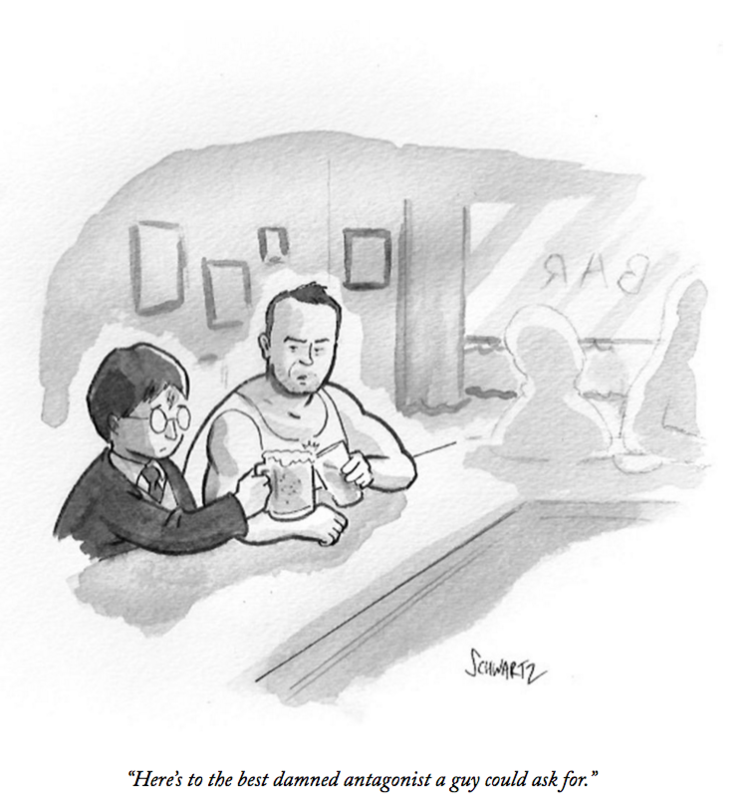 With thanks to Alan Rickman.